Soviet ace fighter pilot, Hero of the Soviet Union Mikhail Baranov. Stalingrad, 1942. 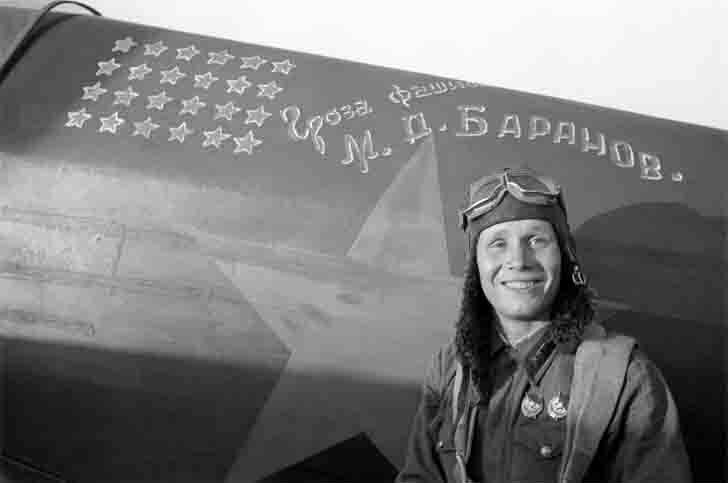 Mikhail Baranov – one of the best fighter pilots of World War II, the most effective at the time of his death, and many of his victories have been won on the initial, most difficult period of the war. If not for his accidental death, he would be in the same glorified pilot as Pokryshkin or Kozhedub. Hero of Soviet Union, deputy squadron commander of the 183rd Fighter Regiment 289 th Fighter Division, 8 th Air Army of the Southwestern Front, the senior lieutenant. Member of the Great Patriotic War from June 1941.. He fought on the Southern Front. By October 1941, personally destroyed five enemy aircraft. 5 and 6 November was awarded two Orders of the Red Banner, and November 8 in a dogfight shot down a He-111 and Me-109. In February 1942 he was appointed deputy commander of the squadron. Senior Lieutenant Mikhail Baranov to June 1942 has made 176 sorties, shot down 20 enemy planes and 6 destroyed during raids by the Luftwaffe airfields. Hero of the Soviet Union and the Order of Lenin and medal “Gold Star» (number 578) was awarded to Mikhail Baranov, 12 August 1942. August 6, 1942 Mikhail Baranov took off the alarm in the composition of the Yak-1 fighter group to intercept enemy bombers Ju-87 on their way to the city under cover of Kotelnikovo Bf.109F Messerschmitt fighters. Cily were unequal, but the Soviet pilots engaged in battle. Baranov shot down two “Messerschmitt” and one S-87, but during the fight he ran out of ammunition. Then Baranov shot down another Me-109, dealing him a blow on the tail wing. Then she took up with another German fighter on a collision course, rammed him, but his plane was badly damaged and fell. Baranov landed by parachute and soon returned to his regiment. During the landing hurt his leg and spine. The medical board suspended him from the flight, but he continued to fly. Soon, he was appointed as the navigator of the regiment, and then transferred to the 9 th Guards Fighter Aviation Regiment Odessa. often sick because of not finished the cure of wounds. One fly in the middle of November 1942 brought a spasm leg. He was sent to a rest home. There, he became worse and he was in the hospital. The regiment returned January 15, 1943 with a medical report: “Subject to outpatient care in part, to prevent the flight time.” January 17, he obtained permission to take off. The first flight has refused one of the devices. Then the Rams flew on another plane. During the aerobatics plane suddenly banked, he rolled onto his back, and in this position fell to the ground and exploded. The pilot was killed. He was buried in the city of Volgograd region Kotelnikovo. After the war reburied in Volgograd on Mamayev Hill. Less than a year of fighting has made 285 sorties, 85 air battles personally shot down 31 enemy aircraft and 28 – in the group, 6 aircraft destroyed on the ground. He was awarded the Order of Lenin, 2 orders of the Red Banner.